Who disagreed with Kris Aquino when she said that Filipino women are vain when it comes to hair? I guess nobody 'cause what she said is absolutely true! Thanks to Victor Ortega. More and more Pinays in and around Mandaluyong get to enjoy a discounted hair rebonding service these days. The salon from across the street. The interior with some stylists already working. 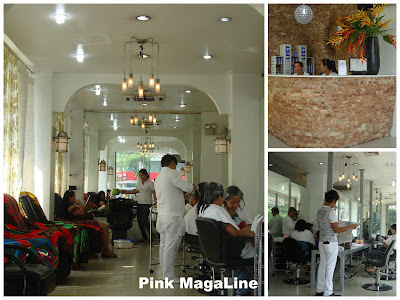 Many people, men, women and even celebrities, are attracted by this salon and spa with its very affordable service. They offer rebonding to digital perming, manicure and pedicure to paraffin waxing. I first heard of this place from old officemates. They were talking about hair rebonding in only P1000 (less than $25). I was intrigued and later visited the place to try. My first rebonding from Victor Ortega Salon came out nicely. I had no complains, so I visited them again for the same treatment last week. I will do a separate post for that. For the meantime, check my first rebonding experience HERE. 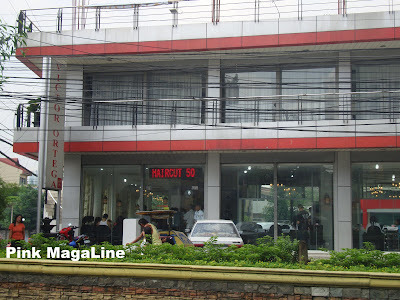 I should try this hair salon; it's just near our place. Where exactly in Mandaluyong is this? By the way, next time you see us (mommy bloggers) in events, don't hesitate to approach us. Mababait naman kami! wow thats a good price.. saan yan banda sis? I am still torn whether to get my hair rebonded or permed. But I have a few more months to think about it, since I have yet to grow my hair a bit longer. BTW, this new blog is fantabulous! waaaaaaa...ang taray...my gosh...ang mura nga sis...I had my hair re-bonded when we visited the Philippines last January sa Cebu...and I paid 6k...waaaaa...sayang!...lol! sa boni at kalentong lang alam kong branch nila..
V.O is very near my place, but I haven't tried their services yet. Better yet, call them for inquiries.